Thin-section under crossed-nicols (5 mm in diameter). This rock is holocrystalline, porphyritic-aphanitic with subhedral fine- to medium-grained phenocrysts in a grey-brown groundmass (23%) composed of fine-grained mica and opaques. All crystals are subhedral except fluorite, which is anhedral, and opaque minerals, which are subhedral to anhedral. 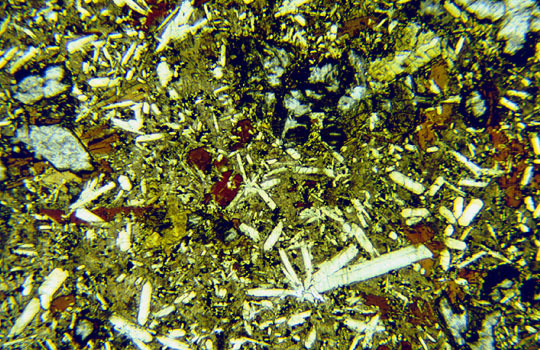 The following are present as phenocryst phases: titanaugite occurs as stellate clusters ranging from .5 to 2.0 mm and exhibiting hourglass zonation; minor amounts of orthopyroxene (.5- 1.5 mm); biotite (< 1 mm); opaques (< .1 mm); spherulite (.2-.5 mm); Small quantities of analcite, apatite, hornblende, plagioclase, sphene and leucite are also present as fine-grained (all .1-.5 mm) crystals; Relict green hornblende (1-5 mm) appears to have been replaced almost entirely by fluorite, following the regional trend for fluorine to scavenge hornblende for Ca2+ to form fluorite. Minor amounts of fine-grained anhedral epidote masses occur throughout the groundmass. The overall texture is glomeroporphyritic.